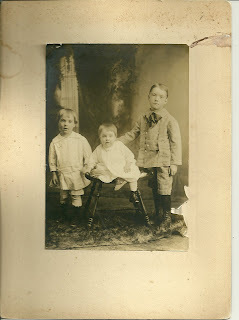 Circa 1920 large photograph of the children of Waldo and Laura Mabel (Rice) Berry, possibly taken at Eastport, Maine. I believe Alvah is at right, as he is the oldest child in the family. There was another daughter, Barbara, but she was born after this photograph was taken. Waldo Emery Berry was born in 1885 and lived until 1985. In one online source his place of death is shown as Portland, Maine; in another, Eastport, Maine. He was the son of Stephen and Hattie Berry of the Machiasport, Maine, area. Waldo's wife, Laura Mabel Rice, was born in 1889 and died in 1986. Laura's parents were William and Addie Rice of Pembroke, Maine. They were certainly a long-lived couple! Waldo moved from Machiasport to Eastport sometime between the 1900 and 1910 Censuses. He appears in the 1910 Census of Eastport, living as a boarder and working at a plant. The Maine Marriages Online Database shows his residence as Eastport for his 1912 marriage to Laura Mabel Rice. The family was living in Eastport when the 1930 Census was enumerated. By 1935, according to the Eastport City Directory, he was dealing in Gas and Oil and doing machinist work, at 71 Washington Street. I've had no luck searching the 1920 Census yet, even searching for each individual person. I'm hoping for some feedback from you or from someone on the Downeast Maine & Maritime Canada Genealogy network. Alvah Elliott Berry was born in 1914 and died in Hartland, Somerset, Maine. He married Florence A. Prest of Eastport on 17 April 1937 - Maine Marriages Online Database. Lawrence Dale Berry was born about 1917. The 1930 census, which shows him living with his family in Eastport, was the only reference to him I could find online. Hazel Adelaide Berry was born about 1919; again, by searching online, I wasn't able to find out anything other than her appearance on the 1930 Census of Eastport, Maine with her family. If you have any information to share on this family, please contact me.